My husband grew up outside of Amish country in Ohio and over the years together we have enjoyed many memorable days in Sugarcreek and Berlin, Ohio among the extraordinary Plain people. Therefore, I was very excited to read A Plain Scandal: An Appleseed Creek Mystery which is the second installment in the Appleseed Creek Mystery series by Amanda Flower which skillfully combines my love for the Amish way of life with the twist of a mystery. This is one of those books that will be sure to keep you wide awake at night as the lead character, Chloe Humphrey who is a computer specialist moves to Appleseed Creak which is in the heart of Ohio Amish Country. Bringing the ugliness of the modern world into Amish life, crimes against the Amish people are taking place i.e. a buggy accident is actually a murder and a criminal is cutting the long hair of Amish women and the beards of Amish men. When Chloe discovers that an Amish businessman is the latest victim of this unknown assailant and that he has been murdered she sets about finding out who it is so that the peaceful existence known throughout the community can once again come back to those living in Appleseed Creek. A Plain Scandal: An Appleseed Creek Mystery is a captivating mystery and I appreciate that the author writes very respectfully as she develops interesting Amish characters that are true to the Plain way of life. If you are interested in Amish fiction and enjoy a good mystery then you are not going to want to miss reading A Plain Scandal: An Appleseed Creek Mystery. I have not read the first book in this series however I am definitely going to add it to my reading list. You are invited to visit the author’s website to learn more about the Appleseed Creek Mystery series and purchase your copy of A Plain Scandal: An Appleseed Creek Mystery. A Plain Scandal: An Appleseed Creek Mystery is available for purchase now in paperback on Amazon.com for only $10.19 (SRP of $14.99)! I learned that this is the second installment in this (Appleseed Creek Mystery) series, and that Amanda Flower has 2 additional series as well. 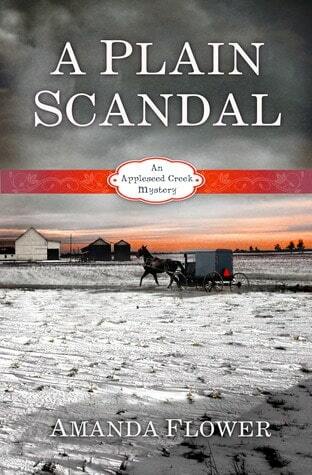 It Would Be Great To Win A Copy Of A Plain Scandal:An Appleseed Creek Mystery By Amanda Flower. Visit the author, Amanda Flower’s website and comment on something interesting you like or learned. I Learned That Amanda is an academic librarian for a small college near Cleveland. The author knew she wanted to be a writer from the time she was in sixth grade. I learned that A Plain Scandal is the second book in the Appleseed Creek Mystery series. Amanda will be publishing a mystery series for 8 to 12 year olds starting this coming September. Sounds good. that she knew what she wanted to be from a very early age. I found out there is a third mystery in the series to be published this fall. Her books have gotten very good reviews. I learned that the author knew she wanted to be a writer since the age of 6. She has written books other than “Amish” stories. I learned this is the second installment of the series.. would love to read the first. I found out that she started writing in elementry school. The book comes in large print and that is for me. I would like to read her other book Plain Death. I learned that this is the second book in a series and I will definitely look for this at my bookstore. Sounds excellent and different. She is associated with Goodreads.com. I learned the Amish in the quiet Appleseed Creek community are under attack. An unknown assailant is cutting off the long hair of Amish women and the beards of Amish men. Sounds good and I love Amish stories. Thanks for this contest!